• Portland played one of its best games of the season — at least for three quarters — and still fell short against the Rockets (20-4), who have won nine in a row and 15 of their last 16. The way the Blazers (13-12) played — again, for most of the way — few NBA teams would have beaten them. As it was, Portland dropped its fourth straight game — all at Moda — to fall to 7-8 on the home court this season. "I'm not into moral victories," said Portland point guard Damian Lillard, who matched the franchise record by sinking nine 3-point shots. "But if we had that type of effort against any of the previous teams, we might have come out of this homestand 3-1." Lillard is right. With the kind of performance they had Saturday night, the Blazers may very well have knocked off Milwaukee, New Orleans and Washington in succession instead of losing against all three coming home off a 4-1 road trip. After a symphonic masterpiece through three quarters — and achieving a 98-84 lead — the Blazers played a flat note over the final 12 minutes, getting outscored 40-19 by James Harden, Chris Paul and company. Harden scored 15 of his 48 points in the fourth quarter and also grabbed eight rebounds. Paul contributed 26 points and seven assists. 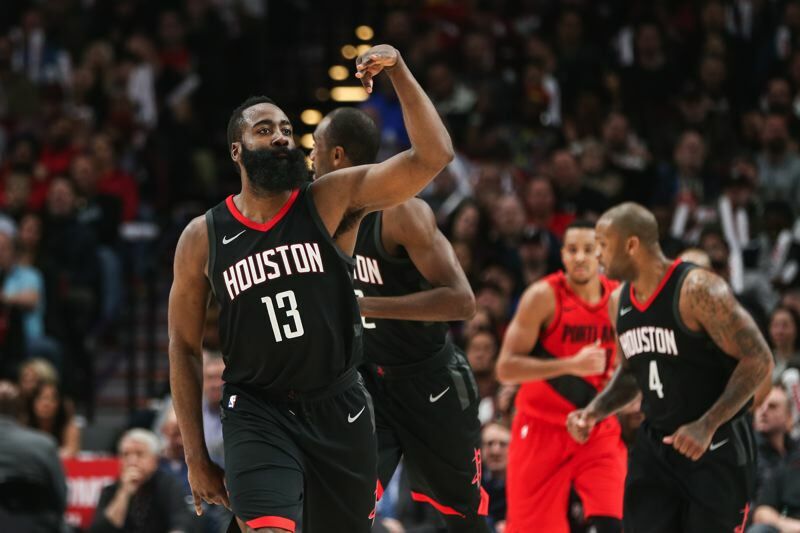 They were the lynchpins as Houston coach Mike D'Antoni went small down the stretch, going with four guards and small forward Luc Mbah a Moute. The Rockets were a runaway train, hitting 15 of 18 shots from the field — many of them at the basket — in the final period. "It devolved into a one-on-one game," Portland coach Terry Stotts said. Exactly the way D'Antoni planned it. "We felt like we had a better shot at guarding (the Blazers) if we could switch everything (defensively)," the one-time Blazer assistant coach said. "It became more of a one-on-one game. We stepped it up in the fourth quarter. We did what we needed to do, and we got it done." • Portland was missing two starters — center Jusuf Nurkic (ankle) and small forward Moe Harkless (quad). Meyers Leonard started his first game of the season in place of Nurkic, contributing 12 points on 5-for-8 shooting along with four rebounds in 20 minutes. Evan Turner, starting for Harkless, was not much of a factor, with four points, four rebounds and five fouls in 27 minutes. • Much of what Stotts directed his troops to do worked. The Rockets came into the game averaging an NBA-high 44 3-point attempts a game. They finished 10 for 25 from beyond the arc. The Rockets entered averaging 23 assists. They finished with 14. "We took away their passing, we took away their 3's, and they beat us on one-on-one plays," Stotts said. Also at the foul line. Houston was 34 for 42; Portland 9 for 12. "It was ridiculous," Stotts said. Did the referees do a poor job calling the game? "Did I say that?" Stotts asked. What did he mean, then? "There was a big disparity," was all he would say. I'm willing to say the Rockets — especially Harden, who draws fouls like lead to a magnet — got the benefit of the officiating more often than not. "Some were fouls," Lillard allowed, "and some I didn't think were fouls." • Lillard and Paul exchanged words in the first quarter after the Rockets point guard and Leonard got into it following an offensive foul call against Paul. "Meyers tried to hit the ball (out of Paul's hands) so we could get it out quick," Lillard said. "And when he did, (Paul) swung his elbow. There was a discussion with the referee, and (Paul) was trying to say what Meyers did. "(To the referee) I was like, 'That's an elbow, period. You gotta go look at that (on review for a potential flagrant foul).' (Paul) turned to me and said, 'You flopping.' I said, 'I know you're not talking about somebody (else) flopping.' We went back and forth, but it was nothing. Me and him know each other off of the floor." • As good as MVP candidate Harden was, Lillard was right there. He scored 35 points and was 9 for 16 from beyond the arc, matching the franchise single-game record for made treys he shared with Nicolas Batum. • Portland's offense looked as good as it has this season. The Blazers shot .511 from the field and made a season-high 18 3-pointers out of 41 attempts. They had 15 fast-break points — they entered the game averaging a league-low 4.1 — and matched the Rockets' high-tempo game most of the way. "We didn't run a lot of plays," Lillard said. "We weren't looking to the sideline. We spoke to each other. Of course we were receptive to everything the coaches were yelling out to us, but we just went out there and hooped. There was a much better flow to the offense and a level of confidence we need to have every night." Al-Farouq "Chief" Aminu had 15 points and five rebounds and scored all of his points from the 3-point line, going 5 for 8 from beyond the stripe. "We should have gotten the win, but we did a lot of good things," Leonard said. "'Dame' had it going. CJ got into a rhythm. 'Chief' shot the ball well. As a team, we got going offensively. But we have to execute better down the stretch." • The Blazers got contributions from others. Ed Davis had eight points on 4-for-4 shooting and nine rebounds in 15 minutes off the bench. Pat Connaughton played well at both ends, finishing with 10 points despite going 0 for 5 on 3-point attempts. Then there was rookie Zach Collins, inserted in the first quarter for one of few times this season. The 7-footer from Gonzaga — who turned 20 on Nov. 19 — sank a 3-pointer, grabbed two rebounds and had three blocked shots in his 19 minutes. "In practice, in the preseason, I've always liked what he was capable of," Lillard said. "He can move. He can shoot the ball. He's not scared. He's a rim protector. He wants to do anything he can do to help the team, and that showed tonight." Precisely the way Collins feels about it. "I know offensively I'm going to find my spots eventually, but I also know we have the type of team that can score," he said. "The way I can make an immediate impact right now is on the defensive end. And when you play meaningful minutes, it gets your rhythm going." Did Collins know before the game that he would play such a significant role? "The coaches said be ready, but they always say that," he said. "On this team, it's tough to know what your lineup will be game to game." • Before the game, I asked D'Antoni about the Blazers' sluggish play of late. "That's going to happen to every team," he said. "It's a long season. You're going to go through your ups and downs. Terry does such a great job with them. They're going to be fine. I expect them to be a postseason team." Lillard said he was encouraged by how the Blazers played in light of the way they had performed in the three previous losses. "You go through adversity in an NBA season," he said. "It's how you come out of it. This is a few steps in the right direction. We played with good direction offensively. We competed really hard. We showed some care. We had some assertiveness to us. We lost a close game to the best team in the league right now." If the Rockets aren't the best team, they're in a select group at the top that includes Golden State (21-6), Boston (22-5), Cleveland (19-8) and San Antonio (19-8). Now Portland embarks on a five-game trip that begins at Golden State on Monday and includes stops at Miami, Orlando, Charlotte and Minnesota. "I'm always excited about a challenge," Lillard said. "It was a disappointing homestand. You want to win at least two or three of them. "But I feel like we're in a good place as a group mentally. On the last road trip, we went 4-1 and didn't play great. Tonight we played a good game. We turned it in the right direction. Hopefully we can play better on this trip." The Blazers are sixth in the West, but they're among a jumble of six teams within 2 1/2 games in the standings. They're only 1 1/2 games behind No. 4 Minnesota (15-11), but also only one game ahead of the teams that are in a virtual tie for eighth — Utah (13-4) and Oklahoma City (12-13). In other words, only a game and a half from being out of the playoffs if they were to begin now.